Every once in a while, I am blessed to have read so many great books and use so many great products that I press forward to experience the next without taking the time to review them immediately. That was the case with Doctor Lawrence W. Gold's book "The Plague Within." This is a book about people who are truly ingenious and on the front edge of medical technology that will change the course of humanity. It is also a book about egos that are bigger than life. Life-saving discoveries are pushed to limits much too soon. Jack Byrnes, Medical Director at Berkeley Brier Hospital ICU and his wife Beth, the head ICU nurse are concerned with their Patient Rachel Palmer and are excited with technology that has helped her recover at a rapid, unheard of rate. Greed, egos, overconfidence and shortcuts give way to reality and creates a catastrophe that makes for a believable stress filled and haunting suspense novel that I had trouble putting down. 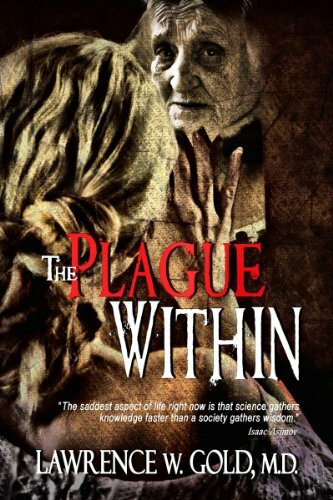 The Plague Within is an intriguing, breathtaking story written by a medical doctor who leaves the reader wondering if this set of circumstances could or will happen in the stage of human need to play God. This author's writing skills and ability to tell a believable fast-paced storyline kept me on the edge of my chair frantically flipping pages from the beginning to the very end. My best guess is that you will do so too.